Լուիզայի մկրտությունը տեղի է ունեցել 1867 թվականի մայիսի 10-ին Մալբորո հաուսում Քենթերբերի արքեպիսկոպոս Չարլզ Լոնգլիի ձեռամբ։ Կնունքն ընդունել են. Ալեքսանդր Դաֆ Ֆայֆի 1-ին դքսի հետ ամուսնությունից ծնվել են մեկ որդի և երկու դուստր. ↑ 2,0 2,1 Susan Flantzer Princess Louise, Princess Royal. ↑ Marks of Cadency in the British Royal Family. Eilers, A.Marlene. 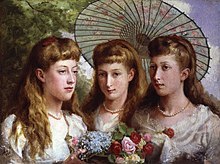 Queen Victoria's Descendants. Baltimore, Maryland : Genealogical Publishing Co, 1987. - P. 176. - 191 էջ, (անգլ.) ISBN 9163059649. Weir, Alison. 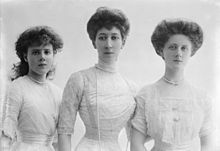 Britain's Royal Families, The Complete Genealogy. London : Random House, 2008. - P. 320. - 400 էջ, (անգլ.) ISBN 9780099539735.